Lung cancer seriously affects the breathing mechanisms of individuals suffering from this type of cancer. Despite the availability of several approved formulations the incidence of this type of cancer, as well as associated mortality, is very high (1). Importantly a report in the Telegraph, a British daily newspaper describes two studies by the Public Health England and Cancer Research UK. They showed that above 8.4% of patients who have lung cancer and 2.4% breast cancer died within a month on the initiation of chemotherapy. After very careful evaluations, results revealed that chemotherapeutic formulations are the primary reason. As such based on these results, the article concludes that chemotherapeutic medications instead of treating the patients are responsible for their death, and unfortunately mortality is high among people having lung cancer (2). There are several other reports of similar nature also. Under such circumstances, traditional medicines are a better choice than the conventional chemotherapeutics. Among several traditional formulations, the Nigella sativa extract and oil have shown relatively better effects in controlling lung cancer when compared with all other existing formulations. Importantly, Nigella is one of the safest dietary ingredients for consumption purposes. As such, based on the current scientific and empirical information this article summarizes proof of concept studies showing better control of lung cancer with Nigella sativa oil. This herbal product is recognized highly safe by the Food and Drug Administration of the USA and effectively kills cancerous cells of the lungs proved through several scientific studies. Importantly, Nigella mediated cancer control is through several mechanisms including boosting the body defense system naturally and safely. Lung cancer is the leading cause of death globally. Although patients suffering with this type of cancer have several treatment options like surgery, lobectomy, radiation, and chemotherapies, the highest death associated with this type of cancer suggest the disease is not being handled properly. Public health experts believe that several of the approved formulations have undesired side effects adversely affecting patient quality of life and sometimes linked with morbidity and mortality. This situation demands to investigate and approve through drug regulatory authorities alternative treatment methodologies like traditional medicine for individuals who have lung cancer. Among the various traditional medicine used in the treatment of lung cancer, the Nigella sativa or black cumin seed oil shines out. A vast body of scientific knowledge strongly suggests that treating lung cancer individuals with Nigella could be a better choice. For a thorough discussion on the effect of Nigella sativa oil in lung cancer, it is important to investigate pre-clinical studies both in the in vitro and in vivo model. It will be essential to bring it to the readers' attention that anti-cancer drug development or any other pharmaceutical agents it should have support from the in vitro and in vivo models. The Nigella sativa oil usage in the treatment of lung cancer has strong support from both the in vitro and in vivo models. This article mainly describes effects of Nigella sativa specifically on lung cancer; however, a study evaluated the effects of black cumin seed oil in a multi-organ carcinogenesis rat model primarily taking into consideration the colon, lungs, esophagus, and stomach (3). The findings of this study are quite intriguing. Researchers concluded that black seed oil is the ideal cancer protective agent and a natural chemotherapy, as it effectively controls the growth of tumor cells. The effects of anti-cancer agents on the cancer cell lines has greatly helped in the development of existing anti-cancer medicines. The effects of various chemicals to inhibit the growth of cancer cell line is the first step for further progressing with its development as an approved formulation. The in vitro studies do not provide any information about the toxicity of drug being developed. However, in the case of Nigella sativa, its safety profile is already proved at several levels. The product has been used as a dietary ingredient as well as its historical usage in traditional medicine. Nigella sativa oil and its extracts have continuously shown their potential to inhibit the growth of lung cancer cell lines suggesting the highest probability of this product in controlling lung cancer. A study compared the effects of Nigella seed extracts and oil extracted from the seeds on a lung cancer cell line A-549. This cell line is considered as a representative of the pulmonary adenocarcinoma and has been widely used to test anti-lung cancer compounds (4). Intriguing observation of comparative study evaluating Nigella sativa oil and seed extract suggest that oil is more effective in inducing control of cancer cell line growth when compared with extract. Importantly, another observation that supports the Nigella oil to be more effective in controlling cancer cell lines growth is that as the concentration of oil is increased the anti-cancer effects multiply proportionately (5). So, based on these observations, it is prudent that Nigella oil should be recommended for lung cancer patient. As far as the dosage is concerned, it should be optimized based on patient capability. This in vitro study shows a concentration-related enhanced anti-lung cancer effect. This is just one study to quote here for convincing the readers about the benefits of Nigella oil. There are several other scientific and empirical studies that suggest Nigella oil efficacy potentials for overcoming lung cancer. The Nigella sativa oil effects in providing relief for the lung cancer has also been proved in the animal studies. Of importance, animal studies data is considered crucial in moving with the further approval of a drug by the regulatory authorities across the world. A study evaluated the effects of Nigella sativa oil in mice model. In this study twenty mice having age in between 5 -6 weeks were injected with a cancer cell line (NCI-H460). The mice used in this study were SCID (severe combined immune deficiency). These mice have suppressed the immune system and are used primarily for cancer model. Upon injection of cancer cells, the mice quickly developed lung cancer (within one week). These mice manifesting lung cancer were divided into two groups (ten in each group). One group received the Nigella sativa oil, whereas the other canola oil. Besides the effects of Nigella sativa on lung cancer, several other biochemical parameters associated with cancer were also evaluated. There was significant control of lung cancer with Nigella oil 6.Based on the findings, scientists involved in this study conclude that the role of Nigella oil in control of lung cancer in the animal model as remarkable. Motivated with the benefits of thymoquinone present in the Nigella oil efforts are also ongoing to develop specific delivery methodologies of thymoquinone into the lung cancer. A mice model study showed promising data regarding the direct delivery of thymoquinone into the lungs followed by control of lung cancer (7). How Nigella sativa Oil Control Growth of Lung Cancer? The exact molecular mechanisms involved in the onset of lung cancer are not known completely. Existing chemotherapeutics, radiations mediated death of cancerous cells or removal by operation all have certain collateral damages to the body besides side effects. Under these scenarios, natural products having a safer profile are considered the ideal choice. The US Food and Drug Administration approve nigella sativa as a safer dietary ingredient and a such its effects on controlling lung cancer growth is quite promising. This has led to a significant interest in evaluating the anti-lung cancer effect of Nigella and the molecular mechanisms involved. It is important to mention here that Nigella seeds are rich in oil and the oily fractions besides several other constituents also have thymoquinone (TQ) that has shown immunomodulatory, anti-inflammatory as well as anti-cancer effect. The oil extracted from the Nigella seeds is rich in TQ. Studies have proved that TQ present in the Nigella sativa oil exerts its anti-cancer effect through three different mechanisms. These mechanisms are also supposed to be involved in the control of lung cancer as discussed in the in vitro and in vivo studies. 1. Enhancing the impact of tumor suppressor genes in the human body. Mainly the genes getting modulated with thymoquinone are p53 and PTEN. As we know, cancer brings mostly changes in the human genetic material. These changes are known as mutations. If there is a way to control mutation, then several types of cancer including lung cancer can be effectively controlled. All set of genes, we humans have been collectively knowns as the genome. The p53 gene is considered as the guardian of the genome and hinders the onset of cancer by stopping the tumor relevant mutations. The effect of thymoquinone on the elevation of p53 in the lung cancer cell line A549 is a strong indication suggesting the benefits of Nigella oil in controlling lung cancer (9). The Phosphatase and tensin homolog(PTEN) gene produce a protein that protects humans from cancer, and in the majority of cancer, there is a mutation in the PTEN gene. The Nigella sativa oil constituent thymoquinone has also been reported to elevate the levels of PTEN another promising molecular mechanism by which Nigella oil exerts its beneficial effects in controlling the lung cancer (8). 2. Inducing death of cancer cells by enhancing Bax/Bcl-2 ratio. The Bax and Bcl-2 proteins are involved in the pathogenesis of cancer. Lower levels of Bax/Bcl-2 ratio suggest the progression of cancer, whereas, a higher number for this ratio indicate that cancer is being controlled appropriately. A very recent study published in the year 2018 suggest that thymoquinone significantly elevated the ratio of Bax/Bcl-2 proteins thus providing a molecular mechanism for lung cancer control (9). The fining of this study is a substantial proof of concept that Nigella sativa oil intake can overcome lung cancer without undergoing through the complex chemotherapeutic regiment. It is timely for the US National Cancer Institute of the National Institute of Health to investigate these findings carefully. A comparative clinical trial of existing lung cancer medications approved by the US Food and Drug Administration and Nigella sativa oil is presumed to support the use of Nigella oil, a safer treatment among all the existing one. Reducing the levels of gene products that promote lung cancer. Mainly the genes get controlled with the thymoquinone are AKT, PI3K, and VEGF. A fascinating study recently published in the Journal of Immunology is compelling proof of concept for the use of Nigella sativa oil in the treatment of lung cancer. 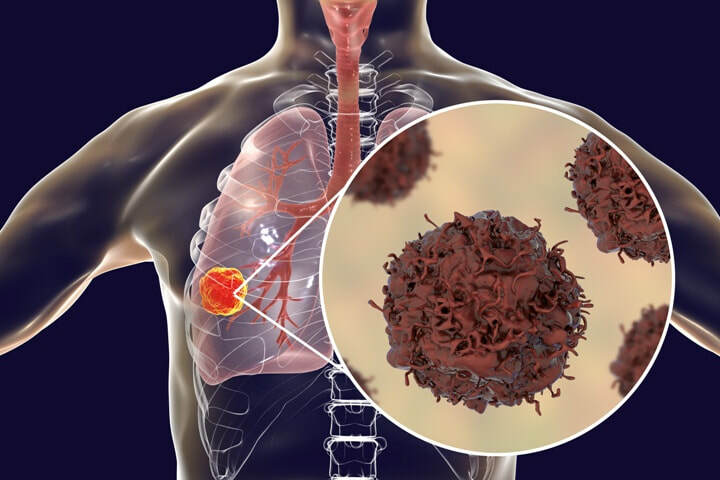 According to this study, the thymoquinone, the major constituent of the Nigella oil activates natural killer cells when grown together with lung cancer cell line A549. Furthermore, the natural killer cells also actively wiped out cancer cells in the presence of thymoquinone. This study also shows up-regulation of several other molecular moieties involved in cancer control (10). The finding of this study is so convincing that it is timely to initiate formal clinical trials without any delay. However, people who have lung cancer can take Nigella sativa oil that is the rich source of thymoquinone. As the Nigella sativa is already recognized as a safer dietary ingredient. Based on all the above scientific information and empirical findings it is safer to conclude that Nigella sativa oil is an ideal treatment for lung cancer. The oil and thymoquinone present in the oily fraction have been evaluated through in vitro studies and animal studies proving its capability to control lung cancer. Importantly, Nigella is recognized by the drug regulatory organization as a safer product. To avoid side effects of the chemotherapeutics and other treatment options Nigella oil should be the choice and first treatment for people who have lung cancer.